Comics Experience Blog: Scott Snyder's LIVE Script Critique on Creators Workshop! 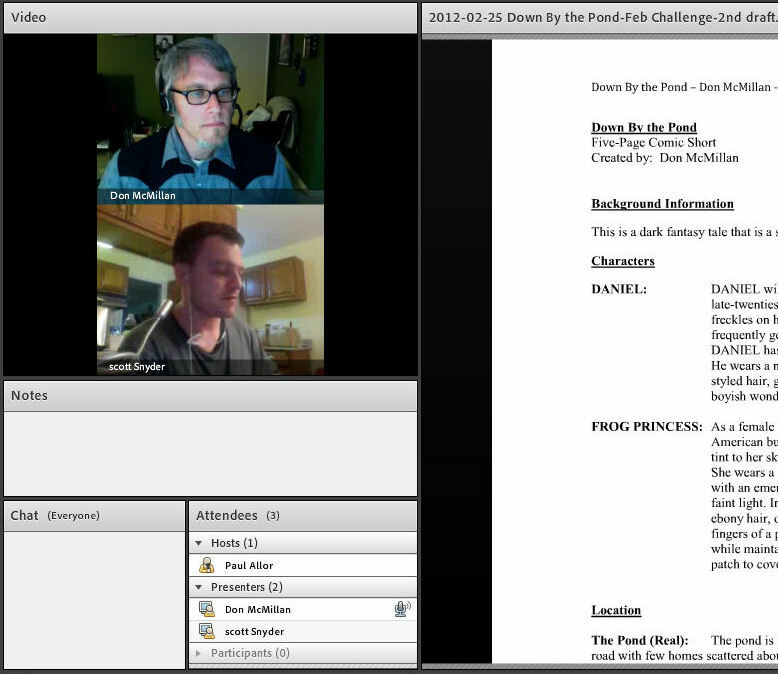 Scott Snyder's LIVE Script Critique on Creators Workshop! On March 13, 2012, Comics Experience Creators Workshop member, Don McMillan, received a live, web conference critique of his work by highly-acclaimed writer, Scott Snyder! The Creators Workshop is an on-going community of writers and artists all dedicated to getting published and improving their craft. Our members post their work, critique each other, and discuss all aspects of creating comics in our members-only forums. But in addition to all that, members are eligible each month for critique by our instructors and special guests! This month's special guest script critiquer was Scott Snyder, the red-hot writer of Batman and Swamp Thing from DC Comics, American Vampire from DC/Vertigo, and the horror title Severed from Image. 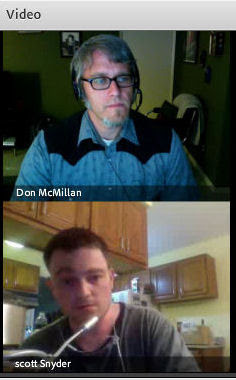 Scott not only agreed to provide a guest critique to this month's winner, but further volunteered to do it LIVE with Don. Scott provided in-depth feedback on Don's script, "Down by the Pond," during a session that lasted over an hour and a half! After it was all over, Don tweeted, "Thank you @Ssnyder1835 for the incredible feedback and for taking the time out of your crazy schedule to talk." With Scott and Don's permission, the session was recorded so that all Workshop members could learn from Scott as well. The recording will be available to members for several weeks. • as well as Scott Snyder! This past month, members were eligible for a script review by Cullen Bunn or an art review by Brian Hurtt, the collaborators on books like The Sixth Gun and The Damned from Oni Press, among many other individual credits with Marvel, DC, and more. Each month, a member also receives critiques from our staff members and professional contributors like: Comics Experience founder Andy Schmidt (writer, and former Marvel and IDW Editor); professional penciler and Comics Experience art instructor, Robert Atkins (Snake Eyes, GI Joe, Heroes for Hire); former Marvel Editors Alejandro Arbona and Nicole Boose; and other comics professionals like IDW Editor Bobby Curnow, pro artist Sean Chen, and pro writer David Gallaher. The Creators Workshop is the ideal place to receive honest and helpful feedback on your work from both like-minded colleagues and professionals! Comics Experience thanks Scott Snyder -- and ALL our guest reviewers -- for being so incredibly generous with their time and knowledge!